Offered for sale is an original Japanese red vinyl pressing of Relics by Pink Floyd, complete with the original obi. 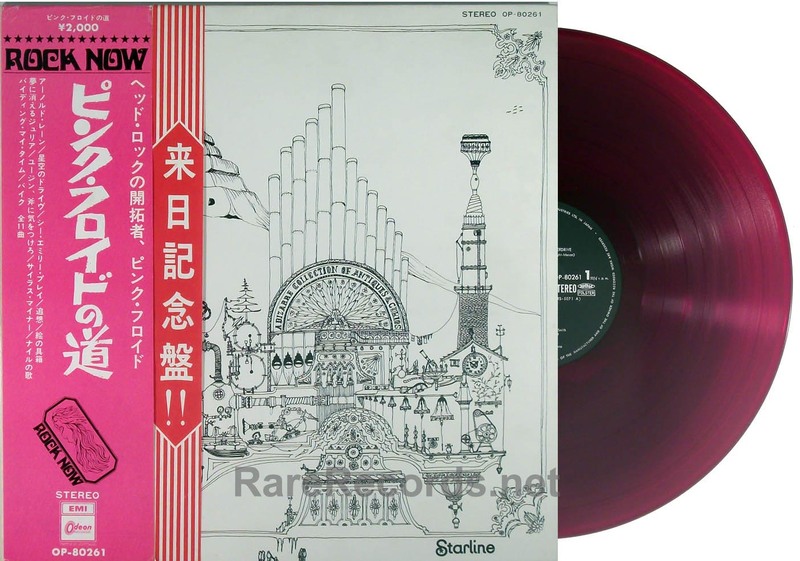 About this copy: This copy of Relics is an original Japanese pressing from 1971, pressed on red “Everclean” vinyl. Only the first pressings were red vinyl; all subsequent pressings were black vinyl issues. The Japanese pressings feature the artwork by Nick Mason on the cover that was not used on the U.S. pressings. In addition, the Japanese LP had a gatefold cover that was unique to Japan, featuring photos of the band on the inside of the cover. The gatefold cover is VG++, with some light foxing. The pink “Rock Now” obi is VG+,with a few wrinkles. The “hojyuhyo”, or reorder tag, is missing. This copy has a second obi, which was added to the album during a Pink Floyd tour. The red vinyl disc is VG+, with some very light scuffs and a few spindle marks on the label. A beautiful copy of a terrific record. Background: Relics is often an afterthought when thinking about Pink Floyd’s catalog, but the compilation, released in 1971, offers some nice tracks from the band’s early career, as well as a couple of songs (“Paint Box” and “Biding My Time”) that aren’t otherwise available on U.S. albums. Since Relics is a compilation and not a regular studio album, it tends to be overlooked when thought of as one of Pink Floyd’s better releases. It might not be regarded as a classic psychedelic masterpiece in the manner of The Piper at the Gates of Dawn, and it certainly won’t ever achieve the multiple platinum status of Dark Side of the Moon, but it’s a pretty good place to start with the band’s early catalog. A little bit of everything that made early Pink Floyd can be found here. Without a doubt, the disc is an essential part of the band’s discography, not to be disregarded due to its overlap with studio album material. Offered for sale is a scarce 2 LP sampler album called Picnic, issued in 1970 in the UK by Harvest Records to promote their label. About this copy: The cover of this set is VG+, with a couple of bent corners. The original price sticker is still attached to the cover. The discs are VG++, and have clearly had only a few plays. A couple of sides have very faint sleeve scuffs. Stampers are AA, AL, AO, AA and there is no EMI logo on the labels. A nice copy of a scarce LP. Background: When Harvest Records was a fairly new label, they issued Picnic at a budget price of 29 shillings/11 pence to promote the label. The 2 LP set contained tracks by Quatermass, Barclay James Harvest, Syd Barrett, Bakerloo, and Pink Floyd. The album was highly sought out by collectors for many years, as it was once the only way to obtain the otherwise-unreleased Pink Floyd track, “Embryo”, which has since been released on several compilations. Offered for sale is an original Japanese pressing of Pink Floyd’s 1970 LP, Atom Heart Mother, pressed on red vinyl and including the original obi. About this copy: The copy offered for sale is in great condition; the cover is VG+, with some edge wear at the top of the cover. The nearly-always-missing obi is also VG+, with just a few wrinkles and it includes the “hojyuhyo” or reorder tag, which is often missing. The red vinyl disc is VG++, with a few very light scuffs and a few spindle marks on the labels. The six page lyric/photo/information insert is included. A nice copy of an album that’s hard to find complete on red vinyl. Background: For many Pink Floyd fans, Atom Heart Mother isn’t their go-to album of choice, but it sold well in a number of countries, particularly Japan. AllMusic.com described it thusly: Appearing after the sprawling, unfocused double-album set Ummagumma, Atom Heart Mother may boast more focus, even a concept, yet that doesn’t mean it’s more accessible. If anything, this is the most impenetrable album Pink Floyd released while on Harvest, which also makes it one of the most interesting of the era. Still, it may be an acquired taste even for fans, especially since it kicks off with a side-long, 23-minute extended orchestral piece that may not seem to head anywhere, but is often intriguing, more in what it suggests than what it achieves. In Japan, first issues of Atom Heart Mother were pressed on red “Everclean” vinyl and while it’s the most common Pink Floyd title to find on red wax, it’s still quite difficult to find one in playable condition and even harder to find with the original obi. Most of the copies of Atom Heart Mother we’ve seen from Japan over the years were in poor condition. Offered for sale is a scarce 2 LP set by Pink Floyd entitled, Milestones, released only in the Netherlands in 1973. About this copy: The copy offered for sale is a first issue of the album with black labels (second issues had red labels.) The records are VG+, with lots of shine but a few small marks. The cover is VG+, with a bit of lamination peeling on the spine. A nice copy of a record that’s rather hard to find in this configuration. Background: With the explosive sales of Dark Side of the Moon in 1973, Pink Floyd’s record company sought to use the sales of that LP to get the public to buy some of the band’s older titles. In most of the world, the early material was issued in a 2 LP set called, A Nice Pair. In the Netherlands, the first two albums, The Piper at the Gates of Dawn and A Saucerful of Secrets, were reissued as a 2 LP set with a gatefold cover, called Milestones. This album included the original UK version of the first album with eleven tracks, including Astronome Domine, Bike and Flaming, but omitting See Emily Play, which had been included on the American and Japanese versions of the album. About this copy: The copy offered for sale is a second issue of the album with red labels (first issues had black labels.) The records are VG+ on the first album and VG on the second album. The cover is VG, with several bends, and wear on the spine and corners. Offered for sale is a rare and unusual South Korean compilation LP by Pink Floyd, entitled, Best of Pink Floyd. About this copy: The record is M- and looks to have had little, if any play. The cover is VG+, with a bit of wear at the edges and a 1″ split at the center of the top of the cover. The enclosed photo/information insert (text in Korean) is M-. A nice copy of a rare and unusual Pink Floyd LP. The album cover claims that the material is licensed, but we have no idea if this is an authorized issue or not. The quality of the vinyl and cover printing are quite good and similar to the licensed products that have been made in Korea since the late 1980s. 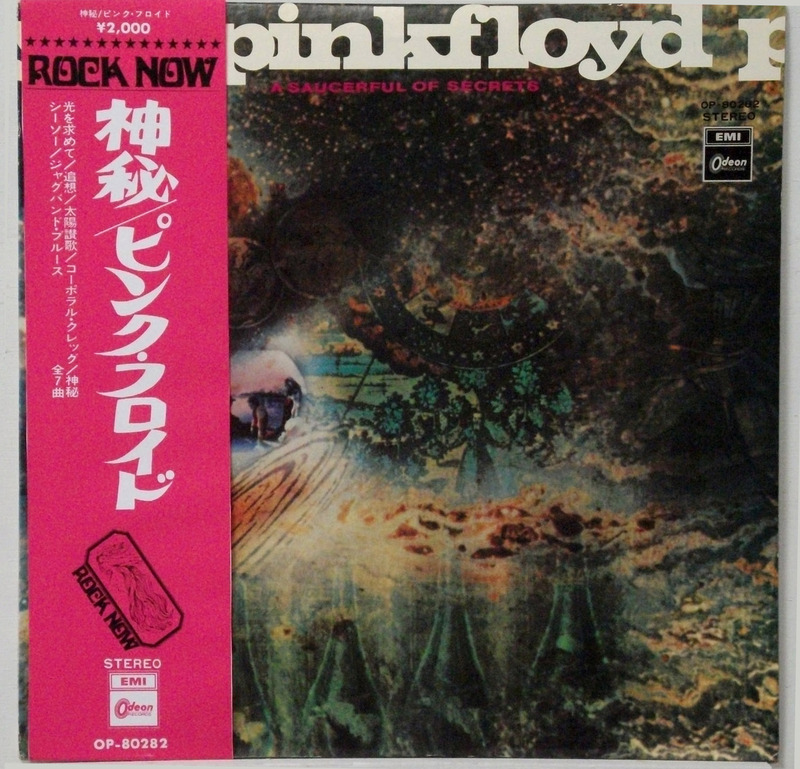 Offered for sale is a 1971 Japanese second pressing of Pink Floyd’s 1968 LP, A Saucerful of Secrets, with lyric insert and reproduction obi. About this copy: This copy of A Saucerful of Secrets is a 1971 second issue, Odeon OP-80282, with the words “Toshiba Musical Industries” on the label. The black vinyl record is M-, with just a couple of spindle marks on the label. It’s the nicest disc we’ve ever seen for this LP. The cover is VG++, with a bit of wear at the corners. A date (1971.8.26) has been written on the back cover in ball point pen. The lyric insert is included. The obi is a reproduction. 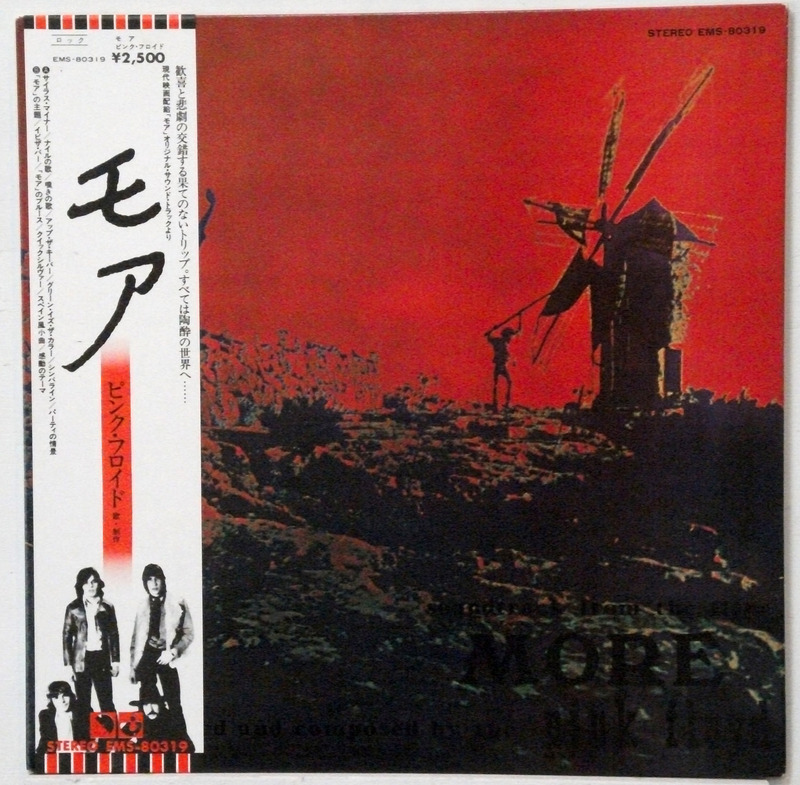 Offered for sale is a Japanese pressing of the band’s 1969 soundtrack album, More. This is a reissue from the mid-1970s. About this copy: The record is M-, with just a couple of spindle marks on the label. There is a small bump in the vinyl on the track, Quicksilver; this is a pressing defect, though the track plays fine. The cover is M-, with a small dent in one corner. This is perhaps the best-sounding pressing of this album we’ve ever heard and it’s in great condition. Background: The soundtrack to the obscure film, More isn’t high on the list of most Pink Floyd fans’ favorite albums, as it’s a bit more mellow and disjointed than most of their work. Of course, soundtracks tend to turn out that way, as the music is written to go along with the film, not to work as a cohesive whole. Still, there’s a good rocker here, The Nile Song (which was released as a single in Japan) and a couple of great ballads by David Gilmour: Green is the Colour, and Cymbaline. As with most albums in Japan, More was released multiple times. The first issue had a single pocket cover; the second issue had a gatefold cover and was pressed on colored vinyl. The third issue was on black vinyl on the Odeon label with a black obi. This is the fourth issue, released circa 1975. It has a gatefold cover with a four page color booklet, a white obi, and is on the brown EMI label. Offered for sale is a beautiful example of a first pressing of the UK LP, EMI EMD 1055, complete with the custom lyric inner sleeve. About this copy: Both the record and cover are M-; the record hasn’t been played more than once or twice. While the blue vinyl American copies turn up for sale from time to time, the UK pressings are rarely available. A beautiful example of a truly scarce LP by an iconic band. Background: Pink Floyd’s 1994 LP, The Division Bell was their second album without founder Roger Waters, and as it happened, their final studio LP. Critics had mixed opinions about the album, but the public liked it and it sold well and was followed by a successful tour. The LP was issued on vinyl in the United States, the United Kingdom and South Korea, and the U.S. and UK copies featured different cover photos from one another. Unlike the American copies, the UK pressings were on black vinyl. The UK pressings are also considerably harder to find than their American counterparts.